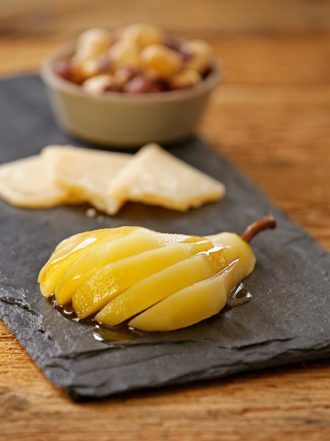 A wheat-flecked Belgian beer flavors these honey-sweetened poached pears. In a medium saucepan, combine the beer and honey, stirring to combine. Squeeze in the juice from the orange and add the orange halves along with the coriander and cloves. Peel and halve the pears and scoop out the cores. Place the pears into the liquid, covering with a piece of parchment paper to help keep them submerged. Turn the heat to medium-high, cover the pot, and bring the pears to a simmer. Once simmering, reduce the heat to medium-low and continue to cook the pears, pushing down on them as necessary, for 15-20 minutes or until just tender when pierced with a fork. Remove the pears and place in a shallow dish, spooning a tablespoon of the liquid over each half to keep them moist. You may discard the remaining liquid. Allow the pears to cool on the counter for 20-30 minutes, and then cover and place in the refrigerator to cool completely. When you’re ready to serve the pears, gently turn them in their liquid to moisten, and then slice into ¼-inch pieces. Drizzle with honey and serve alongside cheeses such as chevre, gouda or Parmigiano-Reggiano. We explore the working studio of the Portland, Oregon–based ceramics company.